2-1/2” lift capacity in 4 different drill bit sizes (1/4”, 5/16”, 3/8”, 1/2″). 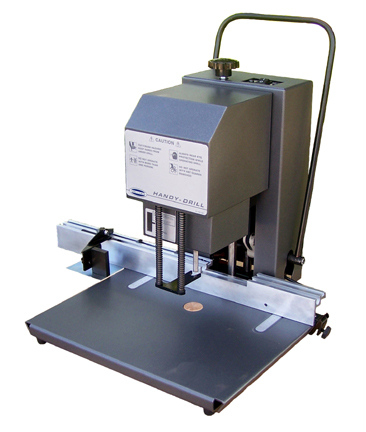 Machine can be converted to a 2” maximum lift capacity for a wider range of available hole sizes (1/8” to 1/2″). Safe to operate – Spindle motor automatically turns on when the pull-down lever is moved and automatically switches off when the lever returns to the up position. Conveniently located chip collector cups – Located around the spindle, they include a sight gauge to signify when the cups are full and need to be emptied. The cups also serve as safety covers with interlock switches. When removed to change the drill bit or to empty the paper chips, power to the motor is locked out until the cups are replaced. Adjustable backgauge stops – The backgauge includes 4 adjustable stops for drilling multiple hole pattern jobs. Just flip the switch and move your pile to the next setting.